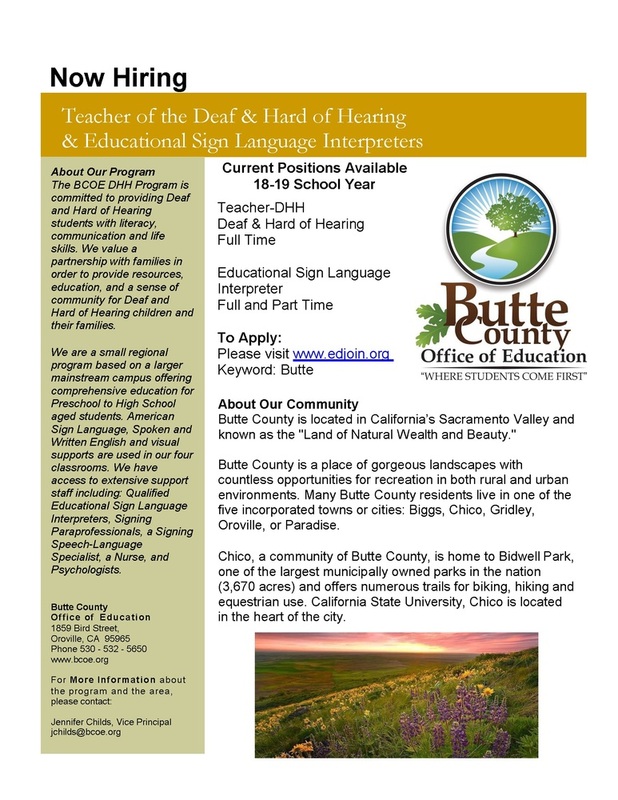 The BCOE DHH Program is committed to providing Deaf and Hard of Hearing students with literacy, communication and life skills. We value a partnership with families in order to provide resources, education, and a sense of community for Deaf and Hard of Hearing children and their families. Educational Sign Language Interpreters, Signing Paraprofessionals, a Signing Speech-Language Specialist, a Nurse, and Psychologists. Butte County is located in California’s Sacramento Valley and known as the "Land of Natural Wealth and Beauty." Butte County is a place of gorgeous landscapes with countless opportunities for recreation in both rural and urban environments. Many Butte County residents live in one of the five incorporated towns or cities: Biggs, Chico, Gridley, Oroville, or Paradise. Chico, a community of Butte County, is home to Bidwell Park, one of the largest municipally owned parks in the nation (3,670 acres) and offers numerous trails for biking, hiking and equestrian use. California State University, Chico is located in the heart of the city.